February 16This morning, Timothy Caudill, 33, a roof bolter at TECO Energys Hazard #4 mine near the town of Hazard, in Eastern Kentucky, became the 20th coal miner to die on the job in the United States this year. According to the Lexington Herald-Leader, Caudill was putting up brattice cloth, a plastic-covered canvas, to direct air-flow in the mine when he was crushed by rock in a roof collapse. Click here for article. Join Militant Fighting Fund campaign to defeat Utah coal mine boss lawsuit. 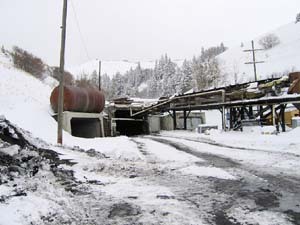 Left: conveyor belt coming out of Horizon coal mine in Carbon County, Utah. Miners discovered February 6 a large section of the roof underground collapsed. Right: Portal of Aberdeen mine nearby, owned by Andalex Resources, where a coal miner was killed January 29. PRICE, UtahThe safety crisis that began with the deadly explosion at the Sago Mine in West Virginia in early January has now claimed the lives of 19 coal miners and three other mine workers across the United States in the first six weeks of this year. The Mine Safety and Health Administration (MSHA) just reported that a miner at a stone quarry near Media, Pennsylvania, was killed on the job February 13. According to MSHA, two other mine workers were killed at stone and gravel operations in January in Arizona and Oregon. The coal bosses push to increase production while coal prices are high, coupled with their disregard for workers safety, are making it certain that such disasters will continue, many miners say. These workers point out that steps are urgently needed to organize all miners into the United Mine Workers of America (UMWA). 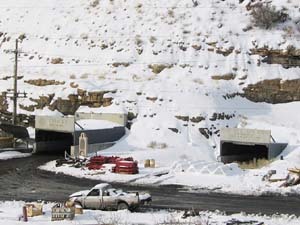 At the Horizon coal mine near Helper, Utah, following a company-sponsored stand down for safety meeting February 6, the day shift entered the mine to find a major roof fall on the belt line, reported workers who requested their names not be used to avoid retaliation by the bosses at this nonunion mine. The collapse was some five feet thick and 45 feet long. The rock had broken right above the five-foot bolts used to secure the roof, workers said. While no one was injured in the fall, it was in a heavily traveled area a few hundred feet from the production section. According to MSHA, Horizon has had eight major roof falls over the last year. Six of these have been in a heavily travelled section of the mine. The area was bolted with five-foot bolts, which was definitely inadequate, said one miner. These shorter roof bolts were used before deteriorating mine conditions led the company to switch to six-foot bolts in newly mined areas in the middle of last year. Sections of the mine with five-foot roof bolts have not been re-bolted. MSHA reports on several of the roof falls at Horizon state: Area was bolted with 5 foot resin bolts prior to change in operators roof plan to 6 foot resin bolts. The government agency, however, has not ordered the company to re-bolt the inadequately protected parts of the mine. A few days following the February 6 stand down for safety meeting at the Aberdeen mine near here, two miners were injured by a coal face blowout, reported workers at that mine, who also asked that their names not be used. Shane Jacobson, a miner with 10 years mining experience, was killed at Aberdeen January 29 when coal from the high production mining section burst out of the wall at high velocity and struck him. The Aberdeen mine, a nonunion operation run by Andalex Resources Inc., is under scrutiny in the media for an alarming number of safety violations. The mine has implemented cosmetic changes underground, say miners who work there, following the death of Jacobson. At the stand down for safety meeting at Aberdeen, company representatives made scant mention of Jacobsons death and instead concentrated on placing responsibility for accidents and injuries on the miners themselves, workers said. Management has resumed production on the long wall, after installing new bounce guards on every hydraulic shield to appease miners, many of whom are questioning the safety of their working conditions. The bounce guards are being fastened with chains and reinforced with pens, metal frames placed behind the bounce guards to absorb the force of blowouts, miners told the Militant. Before Jacobsons death the companys practice was to have guards spaced apart along the long wall machinery, say miners who worked in that section of the mine. Miners had to dash from behind one guard to the next in order to get some protection during frequent blowouts of coal. By spreading out the bounce guards, a method that was unsafe for the miners, the company made it easier to carry out repairs on equipment and remove coal spillage without disrupting production. The spate of coal mining accidents across the country this year has highlighted the ineffectiveness of the governments mine safety agency. Even when MSHA does move to punish an employer found in violation of safety standards its fines are often disregarded. A recent article in the Dominion Post, a daily published in Morgantown, West Virginia, reported that fines against coal operators amounting to $11 million are delinquent. Kentucky mine operator Stanley Osborne has accumulated more than $200,000 in safety fines since the 1980s, but the federal government has not been able to collect the money, the Post said. It reported that MSHA has filed a suit against this mine to recover the money. The payment of fines to MSHA is essentially voluntary, said Wes Addington, a lawyer at the Appalachian Citizens Law Center in Prestonsburg, Kentucky, according to the Post. MSHA spokesman Dirk Fillpot told the Post that 20 percent of the fines have not been paid in the last decade. In addition to coal companies, other mine bosses owe MSHA $5 million in delinquent fines for safety violations. The problem isnt new, but it has gained attention following mining accidents that have left 21 miners dead so far this year, the Post said, in the article it published February 12. The next day, another rock miner was killed, bringing the toll up to 22. The first rock miner to die on the job this year was a 39-year-old mechanic with 12 years of mining experience. According to MSHA, he was fatally injured January 6 while repairing a front loader at a sand and gravel operation in Phoenix, Arizona, owned by Rinker Materials Western Inc.
Dwight Borris, a 60-year-old heavy equipment worker with 10 years on the job, died January 27 at a crushed stone operation near Sherwood, Oregon, owned by Northfork Excavating, Inc. MSHA said Borris was killed when a bulldozer he was operating fell over the edge of a 50-foot-high wall and crashed into the quarry floor, submerging the cab in several feet of mud and water. Charles Davis III, 25, died February 13 at the Pyramid Materials Quarry near Media, Pennsylvania. As this issue goes to press, further details about his death have not been released.